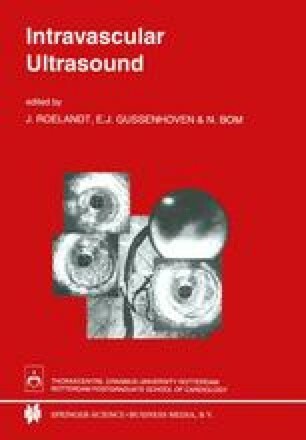 This paper describes the computerized methods for image enhancement, segmentation and three-dimensional (3-D) reconstruction of intravascular ultrasound images. To improve the visibility of the arterial wall when masked by blood scattering, a temporal averaging method was used during off-line analysis. The results showed that the reproducibility of the lumen area measurement was improved 2.4 times with the averaging method (intra-observer variation coefficient: single-frame: 8.8% vs averaged image: 3.6%). To reconstruct a 3-D image from a series of echographic slices, an automatic image segmentation technique based on temporal subtraction was developed. This method applies histogram processing and low-pass filtering techniques for data preprocessing, and dedicated techniques for data postprocessing. The feasibility of this method is demonstrated by 3-D reconstruction derived from a phantom object.